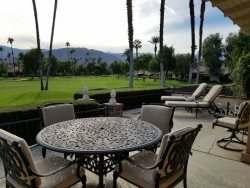 This lovely 2 bedroom, 2 bath with den in Rancho Las Palmas Country Club is decorated throughout in light restful colors and rich with charm and comfort. There is plenty of room to entertain and lots of comfortable chairs to curl up and read a book. There is a king size bed in the master and a queen size bed in the guest bedroom plus a queen size hide-a-bed sofa in the den. The den area has doors that can be closed for privacy and walks through to the guest bath. This condominium provides enough space to easily sleep six. Cable TV’s are located in the living room, den and master bedroom. Guests will lovel the kitchen appliances and lovely serving and cookware. The dinning room provides seating for six and there is a breakfast table in the kitchen for casual meals. The extended back patio is the perfect spot for barbeques with plenty of seating and is located on a greenbelt overlooking a pool and spa. This condominium is the perfect location for a restful vacation. Wireless connection is available as well as free local and long distance U.S. and Canada calling. All team members had a good sense of humor, communicated well with suggestions, and Trish was very efficient in finding this property for us in just one day. Thanks for finding us such an attractive property for our 2 month stay.